AFM are very proud that community support is one of their business key focuses having decided four years ago to give support to one charity annually in Jersey and Guernsey. The chosen charity benefits from the company’s fundraising activities throughout the year. It has proved to be a popular option within the charity sector with over 20 applications from Jersey and 13 from Guernsey received in November last year for the 2019 allocation. Both Islands have a number of staff who sit on a community support committee and once the applications have been received, they are shortlisted and then voted upon. This year the team chose Wigwam in Guernsey and Brighter Futures in Jersey. Wigwam supports parents, family and friends who have been or are involved with children with additional needs whilst Brighter Futures supports local families who are facing significant difficulties or challenges in their life through physical, ill or mental health. Whilst the support is great for the community it also offers AFM an amazing opportunity of team building with fundraising activities such as a weight loss challenge, regular cake sales and dress down days being amongst the initiatives to raise money in 2018. 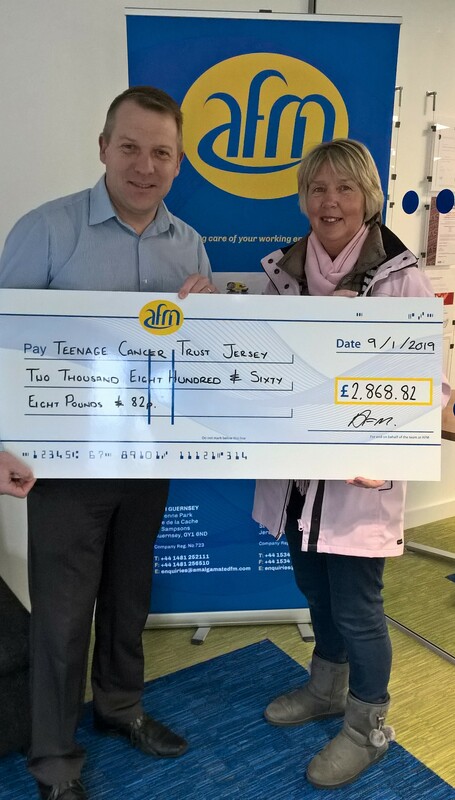 2018’s support to the Guernsey Blind Association and Teenage Cancer Trust amounted to nearly £7,500 being raised across both jurisdictions with nearly £3,000 on Jersey and over £4,500 raised in Guernsey. Whilst AFM work closely with their Charity of the Year to raise money, they also aim to help raise the profile of the charity within the community and also to offer assistance in the form of more practical support, for example the decorating of one of the social areas for the Guernsey Blind Association. AFM Jersey also did a one-off project for Acorn Enterprises by installing some restroom facilities at their Trinity premises. Mark Edgar, AFM’s MD, said, “We are so proud to be able to support our community in this way, we regularly get asked to support charities but by focusing on one for a year, we can make a bigger difference rather than giving a little to lots of charities. The amount of applications we received for 2019 is amazing and shows us that we have the right idea and the staff have a great time participating in the fundraising initiatives throughout the year”.